Children as young as three who were at a youth club in Brixton where a man was stabbed to death have not had any support, a mother has claimed. 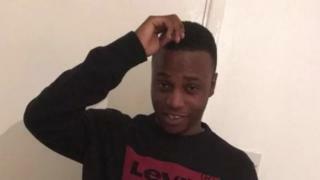 Glendon Spence, 23, was attacked on 21 February at the Marcus Lipton Youth Centre in London and died at the scene. He was stabbed close to where several children were taking part in a football training session. Lambeth Council insisted counselling for those affected had "been made available". Two 17-year-old boys, who cannot be named for legal reasons, have been charged with the murder of Mr Spence, from Lewisham. At the time of the stabbing, the Lambeth Tigers were holding a training session for five to eight-year-olds inside the sports hall. Two three-year-old boys were watching along with their parents when they heard a loud noise and saw people running. One mother called Sarah, who chose not to disclose her surname to safeguard her son's identity, said although the children did not see the stabbing itself they were "absolutely terrified". She told BBC News: "We all just grabbed a couple of the children and headed for the corner of the hall. "I was running back and forth between the halls, just making sure the children are okay and explaining to the parents." Sarah said Mr Spence lay bleeding heavily on the floor in a room 20ft (6m) away from the children. However, she said they could still see what was happening through glass-panelled doors. Dulwich and West Norwood Labour MP Helen Hayes visited the scene on the night of the stabbing, but Sarah said there had been a lack of support from others. "We've not had any follow-up, we've not had any assistance at all," she claimed. "I understand a young man lost his life and it's horrible, but to me I look at the people that witnessed this and were in that particular building as surviving victims that are alive." David Marriott, who was running the Lambeth Tigers football session, echoed Sarah's concerns about the psychological impact on the children. He said: "We have to think about the effect that it may have on them, and I don't think it was really thought about." Mr Marriott wrote a letter to Lambeth Council leader Jack Hopkins and the Mayor of London Sadiq Khan demanding immediate access to counselling and therapy. In response, Lambeth Council arranged a group meeting with a psychologist and said that counselling had been "made available". Mr Hopkins said: "It is shocking that the attack took place at one of the borough's youth centres, which should be a safe haven for those attending. "It is also extremely distressing that this violence was witnessed by young people, alongside the hard-working youth workers at the Marcus Lipton Centre, leaving many of them traumatised."